Something about the farmer and the sun and the garden spoke to my heart. And I loved the fact that there was a real spade incorporated into the work. 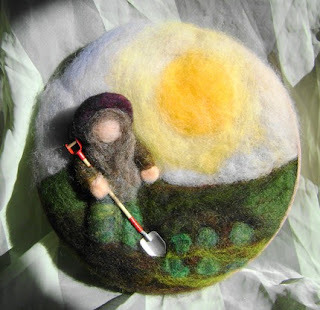 I went to have a look at the artist, a woman named Softearth, and found that not only did she have a number of different needle felted works but that in her profile was a link to her etsy page. So I trundled off to her etsy site only to find that the beautiful item on the card was in fact for sale in her etsy shop. I thought about it for all of a second or so and bought it. Today it arrived, along with a beautiful little something extra. I’m so wrapped with this piece. I can’t wait to hang it in my studio and have the little farmer working on his garden watching over me and mine. Hello just found your blog and I agree that piece is amazing , I love it ! Hi Clare! Thanks for dropping by 🙂 They’re beautiful, arn’t they? If you like this one, do go by her store, for she’s jsut put another couple up.